LIKE us on Facebook to make sure you hear about latest promotion and discount on Park West. We will regularly update Park West Fan Page at Facebook. Please click the Facebook icon and click the thumbs-up icon in Park West Fan Page. Follow us on Twitter to make sure you hear about latest promotions and discount on Park West. We will regularly tweets update to Park West followers. Please click the Twitter icon and search for “ParkWestBGC”. Federal Land is offering 3.5% promotion discount on unit price until further notice for buyers of this new condominium development in Fort Bonifacio Global City. Call me today to reserve your unit before this promotion is over. For more information and inquiries, please see Inquiry. Park West offers as much as 15% discount on unit price if you make a downpayment. Please see the Payment Term for details. 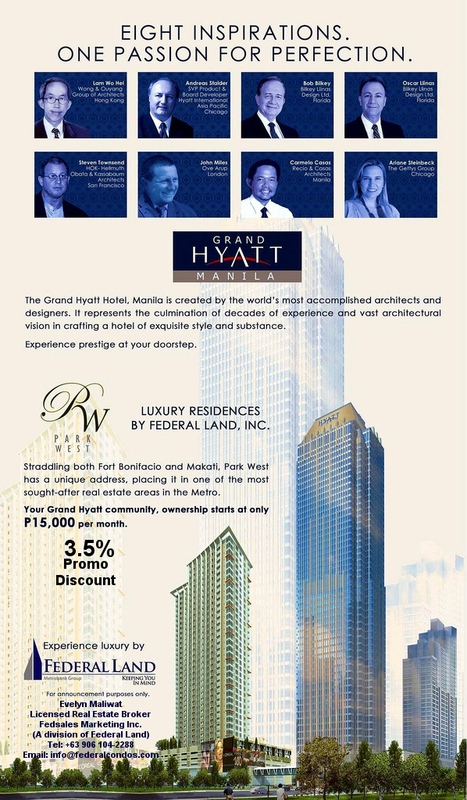 For more information about Park West and for inquiries, please visit Inquiry. Promotion and discount are subject to change without prior notice. Please confirm with Evelyn Maliwat if promotions noted above are still valid.